So, “just for the halibut,” here is another take on one of my favourite Pacific fish, which is in season right now. I found this in a marvelous British Columbia Cookbook I bought last summer, Whitewater Cooks At Home. This has nothing to do with the alleged Bill and Hillary Clinton scandal but rather is a well-regarded restaurant in Nelson, nestled in the beautiful Kootenay Mountains of B.C., and the cookbook has been justifiably a bestseller out here on Canada’s Wet Coast. This super quick version is voluptuously creamy yet sassy with its lime-ginger-cayenne sauce, which highlights yet does not overpower the rich firm flesh of the halibut. A fitting complement afterward could be my cayenne-cocoa cupcakes with citrus-cream-cheese icing, if you like a theme for your meal. This halibut dish might just have you swooning, too, after your first few tastes. The creamy sauce ensures a moist halibut during roasting. 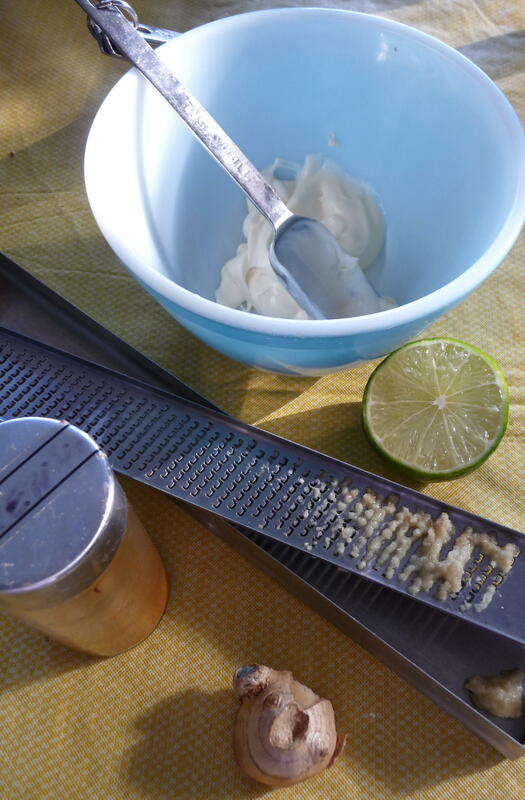 Mix lime juice and zest, grated ginger (it is easiest to use a microplane for the ginger), cayenne, and black pepper with mayonnaise. 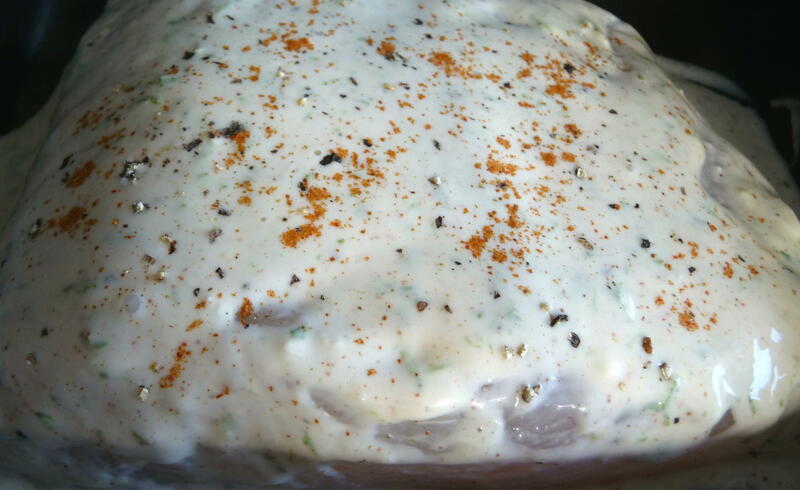 Coat the halibut’s top and sides evenly with cream sauce and place in baking dish. Roast for 15-20 minutes or until just translucent and flaky. Serve with lime wedges and whatever else – just for the halibut. This entry was posted in Main courses, Recipes Misc, Seafood and tagged cayenne, fast, Ginger, Halibut, Healthful, lime, nutritious, Recipe. Bookmark the permalink. You are so very spoiled over there with amazing fish. Every now and then we brave the Whole Foods fish department in land-locked Denver, Colorado and get a piece of fish that is delicious. Your recipe is simple and beautiful- I love that! 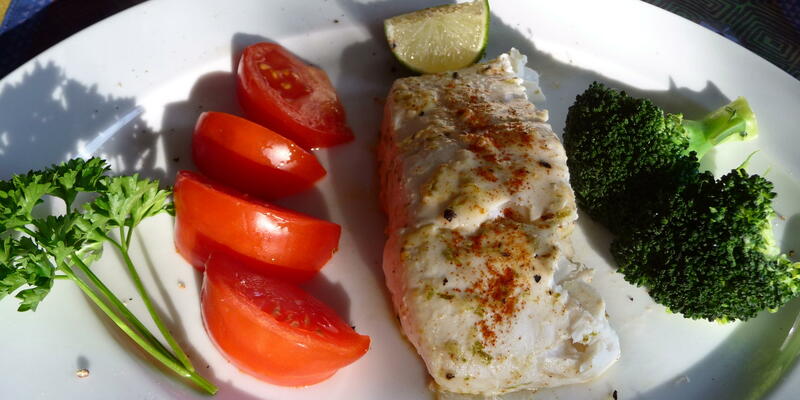 How funny, I had a fish recipe to share today too, but nowhere near as beautiful as yours! Oh Dan. You do make me crave fresh seafood, so! This looks fantastic. I probably could, but it would be ridiculously expensive. When I return to London for good at the end of the week I’m going to go on a mission to buy and make fresh fish dishes!